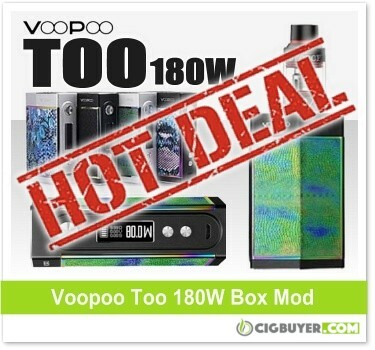 Voopoo Too 180W Box Mod Starter Kit – ONLY $45.00!!! If you’ve had your eye on the Voopoo Too 180W Box Mod, here’s an outstanding deal from US vendor Ecig-City. While supplies last you can get the entire starter kit for only $45.00! The Voopoo Too has a super accurate and reliable GENE Chipset, providing up to 180W of output power, precision temperature control (Ni/Ti/SS/TCR) and an instant firing speed of just 0.010 seconds. Powered by either a single or dual 18650 batteries, the Voopoo Too 180W Box Mod Kit has a unique and stylish design with leather embedded side panels. It includes a two-line 0.91 inch OLED display with customizable settings, 2A micro-USB charging / upgrade port and compatibility with the VooPoo PC App.